Another quick post... have been so busy with unpacking from the move and the upcoming holidays, but I really want to make the effort to post and get back into a blogging groove. Please bear with me with these briefs posts I've done lately. Both of these dishes were crockpot meals from the book, Fresh from the Vegetarian Slow Cooker. 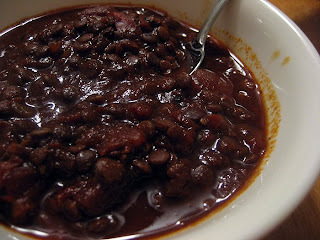 I really enjoyed the Sweet and Spicy Lentil Chili... my hubby, not so much. He didn't care for the lentils. He said he preferred my regular vegetarian chili. I would make this again though, even if I'm the only one who eats it... more for me, more for me! Muhahahahah! ;-p The Tomato Soup was supposed to be pureed and poured over Israeli couscous. 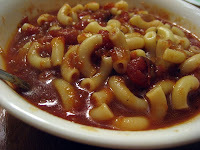 I had the couscous but I'm such a sucker for elbow macaroni noodles in tomato soup that we chose to add those instead. And, my hubby wanted it chunky, not pureed. So, there you go. We both enjoyed this recipe though. Both dishes were perfect this week during the cold weather we've been having lately... winter is definitely here in my neck of the woods!